Denise Johnson has studied Iyengar Yoga since 1988 and has taught since 1990. She received her Iyengar Yoga Introductory teaching certification in 1993 and her Intermediate teaching certification in 2002. Denise regularly attends workshops by senior Iyengar instructors from across the nation, and she attended the nine most recent national Iyengar Yoga conferences, in '90, '93, '96, '01, '04, '07, '10, '13, and '16 as well as the intensive with Mr. Iyengar in Estes Park in September of 2005. She studied in India at the Iyengar Institute the month of October, 2001. 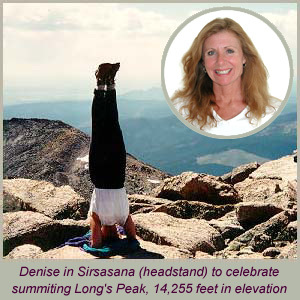 Denise teaches classes at at Grant Ranch in Littleton, and she substitute teaches at other yoga studios, including the Iyengar Yoga Center of Denver and Blue Spruce Yoga in Lakewood. She also teaches private lessons in her fully equipped home studio. Her teaching style is joyous and enthusiastic. Denise's special area of emphasis is restorative yoga for a healthy immune system and relief from life's challenges. She was President of The Yoga Group, a non-profit organization providing free Yoga classes for people living with HIV/AIDS, from 1992 - 2007 and remains on the Board of Directors. Denise received her B.A. in Contemplative Psychology and Buddhist Studies from Naropa University in 2001. For more information about yoga classes or workshops, please call her at 303-794-4050, or send her an email at info@deniseyoga.com. Photo of class in session at Grant Ranch. Iyengar Yoga is the method of Hatha Yoga developed by B.K.S. Iyengar of Pune, India. Mr. Iyengar is the author of Light on Yoga, Light on Pranayama, and other highly regarded books on Yoga. His method of Hatha Yoga is characterized by precision of body alignment, the use of props (blocks, straps, blankets, mats, and chairs) to help students accomplish various Yoga poses, and an understanding of the therapeutic potential of Yoga. The primary focus of Iyengar Yoga for beginners is on the physical Yoga poses. The student can then progress to learning specific breathing exercises (pranayama), and other aspects of Yoga.